For a while, it seemed like tablets were going to become the most popular consumer devices, but then, they weren't. People tired of trying to retrofit them with keyboards to make them faux-laptops -- they just used actual laptops instead. Not to mention, with smartphones getting increasingly larger screens, tablets began to feel a bit redundant. With that said, tablets have their place for media consumption -- I still prefer my iPad to my iPhone for watching videos. If you know someone that wants a tablet this holiday season, but you don't want to spend too much money to get one, Barnes and Noble has a new model that may interest you. Its newest NOOK features a 7-inch screen and has access to the Google Play Store for just $49. This is significantly cheaper than the 10.1-inch variant it launched last month. Best of all, the gift recipient will very likely think you spent more money than you actually did! "The new NOOK 7-inch tablet offers double the storage space as the previous model at 16GB (expandable up to 128GB), a front and rear facing camera, Bluetooth capability, a headphone jack, a speaker, and a microphone. 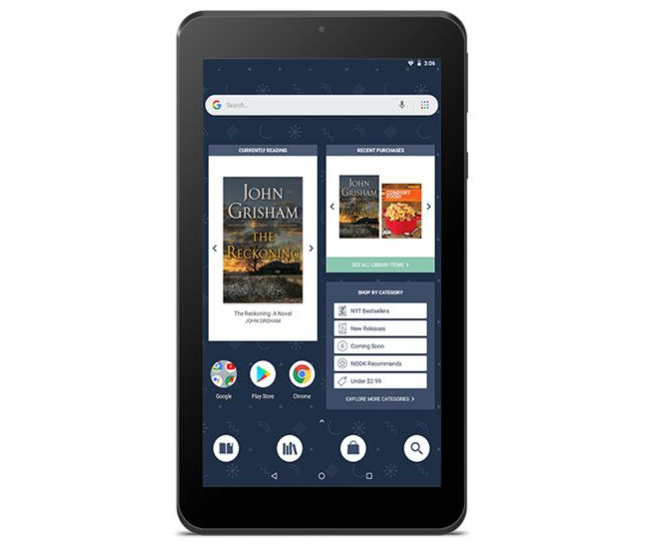 The new NOOK is a full-featured tablet with a beautiful LCD display, connection to the Google Play Store, as well as a soft-touch finish and upgraded NOOK software for an improved reading and browsing experience," says Barnes and Noble. "The new tablet has a custom home screen with easy access to your current read and recent purchases and shortcuts for browsing the NOOK Bookstore and Library. The tablet also gives readers access to Barnes & Noble's Browsery, where book lovers can talk about their favorite books and get recommendations for new ones from a community of fellow readers." Barnes and Noble shares the following specifications. Unfortunately, processor and RAM details are unknown at this time (not a good sign). True, even without knowing the CPU and memory details, this tablet looks very no-frills -- the resolution is pretty bad, and 16GB of storage for a media device is laughable. Still, it should make an excellent first tablet for a child or senior citizen that needs to get their feet wet. Hell, at $49, it would make a great secondary tablet for anyone -- something fairly disposable for the beach or relaxing by the pool. If you'd like to buy the new 7-inch NOOK, you can get it here.